Follow YM Liverpool’s Lawrence Saunders as he makes the short hop across the Irish Sea for a mini-break in Northern Ireland’s capital city. Catching the 10am flight from Liverpool John Lennon Airport (LJLA), my travel companion and I touched down at Belfast International Airport in just over half an hour. easyJet flies from LJLA up to six times a day with prices starting from £46.32 per person. More time on your hands? Stena Line operates a direct route from Liverpool to Belfast with the choice of both day and night crossings. We opted for the 25-minute taxi ride from the airport and arrived at our home for the next two days – Titanic Hotel Belfast, which lies just across the River Lagan from the city centre. Located in the former headquarters of Harland & Wolff – builders of RMS Titanic – the development seamlessly knits together the company’s original office and drawing rooms with modern elements including three glass pavilions. The cavernous spaces where skilled draftsmen designed numerous White Star Line ships including the ill-fated Titanic have been faithfully restored to their former glories. Whilst our room (standard rate is £130 per night) was readied we took sandwiches, soup and our first pint of Guinness in the art deco-styled Harland Bar where an elegant period poster advertising the Belfast Steamship Company’s Liverpool-Belfast night passenger service reminded us of home. Maritime mentions are to be found throughout the hotel, and whilst things were toned down a tad in our stylish twin bedroom, a not so subtle nod to the site’s shipbuilding past was still to be found in the shape of a large mirror adorned with steel rivets. A stunning venue blessed with attentive and genuinely warm staff, Titanic Hotel Belfast made the perfect base to explore the city. Bags dumped, it was time to explore the Titanic Quarter – Belfast’s sprawling waterfront regeneration project – home to apartments, offices, shops, hotels and cultural attractions. Turning right out of the hotel we headed along the 500m Titanic Walkway to visit a piece of floating history in Alexandra Dock, passing Titanic Studios en route – the filming location for HBO’s all-conquering fantasy series ‘Game of Thrones’. Our endpoint was the Cammell Laird-built HMS Caroline – the last surviving vessel from the First World War’s largest naval engagement, The Battle of Jutland. Once on-board, a moving short film detailed the ship’s role in the visceral struggle which lasted a gruelling 36 hours and resulted in the loss of more than 8,000 lives. Navigating the claustrophobic corridors, cramped cabins and stuffy engine rooms, my pal and I shuddered at the thought of what Caroline’s sailors must have gone through. The £10.75 ticket price was more than fair, especially given the huge effort and attention to detail which had clearly gone into restoring the ship and recreating its spaces to look as they would have done more than a century ago. Taking our leave of the light cruiser, we retreated into the welcoming confines of the hotel for a quick freshen up before cocktails in the sophisticated Drawing Office Bar. The Titanic Hotel Belfast’s adjoining Wolff Grill restaurant was our next port of call for an exquisite pairing of smoked scallops, langoustine, cauliflower, parsnip and almonds (£11.50), followed by beef fillet served with carrot, truffle and horseradish (£29). Post-dinner we popped across the river for more drinks and merriment in the Cathedral Quarter. 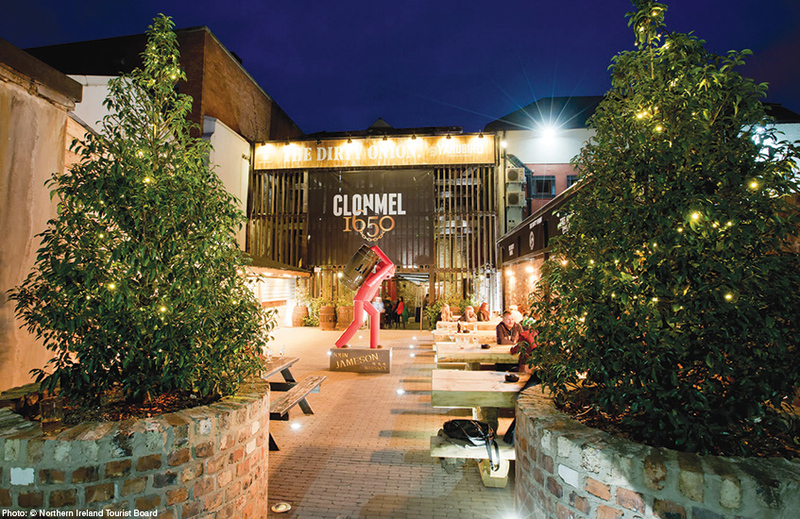 Named after the imposing, Romanesque-style St Anne’s Cathedral which fronts onto Donegall Street, its cobbled streets have become the go-to location on a night out. The curiously named Dirty Onion came highly recommended and didn’t disappoint with a bustling outdoor courtyard teeming with Friday night revellers enjoying live music and a relaxed atmosphere. Next door at the Thirsty Goat locals informed us the quarter was, until only a couple of decades ago, a militarised area – a sign of how far the city has come as a tourist destination. The morning of day two and feeling considerably less than shipshape, we surmised an extended roam around the city centre would do us no harm at all. We shuffled gingerly over the River Lagan via the Lagan Weir footbridge, past the Albert Memorial Clock, which has been called Belfast’s very own Leaning Tower of Pisa because of its pronounced slant. By the time we arrived at Belfast City Hall I, at least, was already feeling better. Alighting from Belfast’s beautiful Neo-Baroque civic building, we continued our hike past the infamous Europa Hotel (once the most bombed hotel in Europe) and the famous Crown Bar opposite with its intricate tiling and cosy private booths. 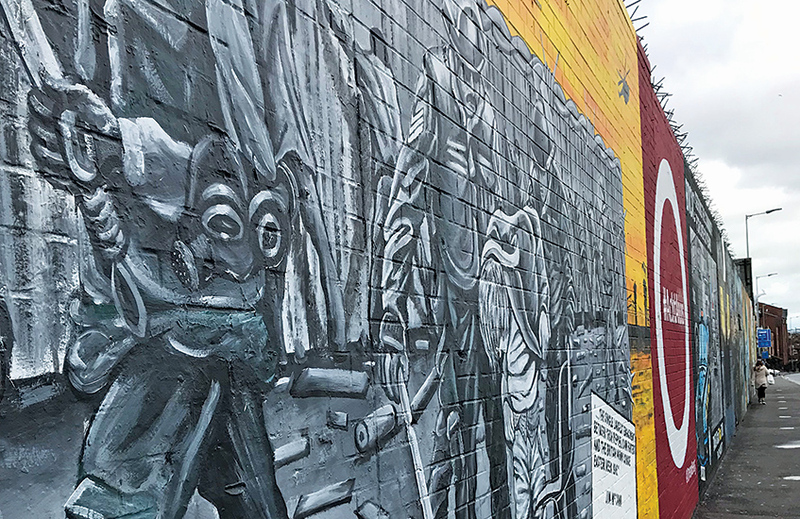 The next leg of our stroll took us to an area which writ large the inescapable fact that whilst much of Belfast is unrecognisable from The Troubles, it remains in part a city divided. Past the Divis Tower and onto the Falls Road, the sobering sight of steel gates separating neighbouring communities came into view. Heading back towards the city centre proper, we made for May Street and the sanctuary of St George’s Market, which was free to enter. The last surviving Victorian covered market in Belfast, every Saturday it offers an extensive range of local and international food alongside arts and crafts stalls and live music. The first vendor we came across was The Belfast Bap Co. which advertised monster meat-filled barms ‘big enough to sink the Titanic’. Tempting as they sounded it was decided an authentic Cubano (£6) from the Cuban Sandwich Factory would be kinder on our rather delicate stomachs. As talented musicians rattled through a repertoire of Irish trad classics I spied the Piece of Cake stall and its heavenly looking Cronut (£2.50). Half croissant, half doughnut with custard in the middle, it was a greasy, creamy, sugary triumph. Suitably full, we made our way back over the river to our final destination – in agreement Liverpool could do with a similarly splendid traditional market of its own. 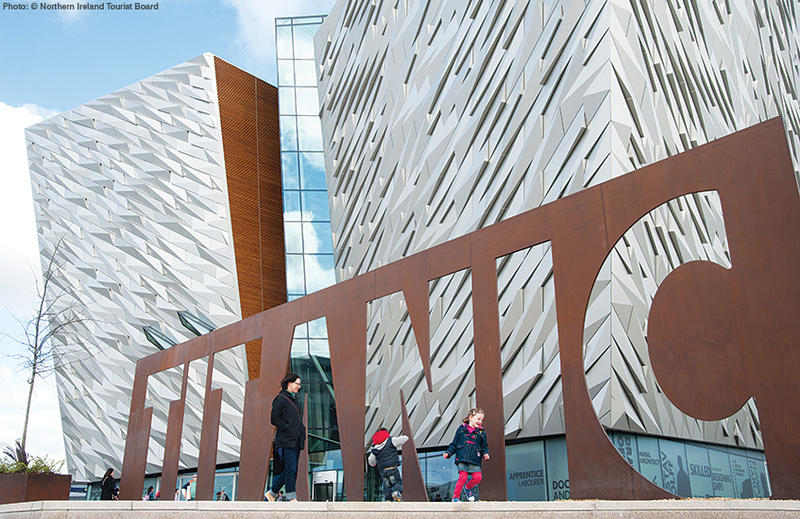 Visually striking from the outside, Titanic Belfast (£18.50 for an adult ticket) boasts the world’s largest Titanic visitor experience inside. Spread over nine interactive galleries, it begins with the story of Belfast’s rich industrial heritage and moves right through to the doomed vessel’s momentous discovery in 1985. The museum does a sterling job of not allowing you to lose sight of the human cost of the tragedy, with displays of heart-breaking memoirs from those who sailed on the ‘unsinkable’ ship and a searchable database of the more than 1,500 souls lost. When it came to recounting the sinking itself, personal accounts were again deftly employed as the final radio transmissions from the stricken giant were pumped through speakers beneath a starry ceiling and sombre visitors below. Thankfully perhaps, I noticed only a passing mention to James Cameron’s 1997 film with Jack and Rose featured on a wall charting the different pieces of art and culture inspired by the 1912 disaster. I confess to being slightly disappointed not to discover any substantial artefacts from the wreck itself, and with so much to see and do in Belfast I wouldn’t necessarily call this an essential stop on your city tour.